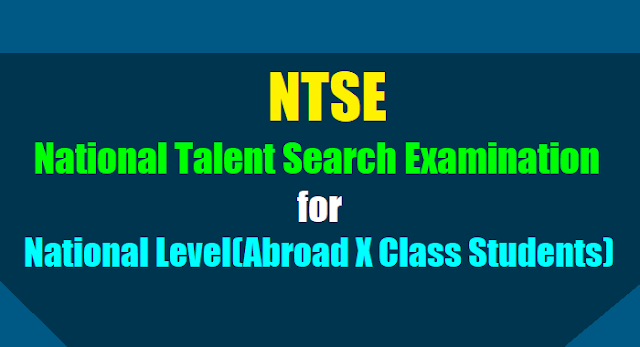 National level NTS Exam 2018, NTSE 2018 Notification/National Talent Search Examination 2018 is Only for the indian national students studying abroad in class X. National Council of Educational Research and Training(NCERT). The National Talent Search Examination for the students studying abroad in Class X is meant to identify and nurture talent. The examination is conducted every year at two levels: Stage-I (State Level) and Stage-II (National Level), however, the students studying abroad are exempted for State Level Stage-I of NTS examinations as per NTS Scheme. National level NTS Exam 2018, NTSE 2018 Notification/National Talent Search Examination 2018, How to Apply, Application Form, Last Date, Exam Date and Results details given below. Qualifying Marks: Qualifying marks for candidates from General category is 40% in each paper and for candidates from SC, ST, PH is 35% in each paper. 1. Use Legal (8.5” x 14”) size paper for taking print. 2. Incomplete/wrongly filled in application forms are liable to be rejected. 3. The Indian Students Studying Abroad should fill the relevant items of the application forms and should forward it to NCERT along with Class IX mark sheet latest by February 29, 2018 for consideration. 4. Please mention the name of State/ UT, where the candidate wants to appear in the national level NTS examination, in the covering letter. 2), given in the form are applicable for the State/ UT only. No reservation will be given against these categories by the NCERT in the national level examination. 6. NCERT is not responsible, if any other item, which is not given in the common application form, has been included by the State/UT. Indian Students Studying Abroad in Class X can appear directly for Stage II NTS Examination under conditions prescribed by the NCERT website. Details of the exam are also available on NCERT website (www.ncert.nic.in). Candidates may fill up the Application Form, available on the NCERT website and send to the undersigned along with a photocopy of the mark sheet of previous examination through post latest by December 31st, 2017.